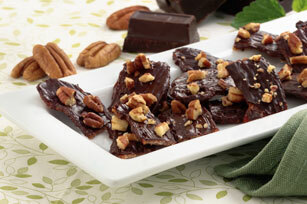 Smoky bacon brings out the sweetness of semi-sweet chocolate in this easy baked crunch recipe. Topped with chopped pecans, it's a wonderful edible gift! Place bacon in single layer in foil-lined 15x10x1-inch pan. Bake 15 to 20 min. or until crisp. Drain on paper towels; place on waxed paper. Melt chocolate as directed on package; brush onto 1 side of bacon. Sprinkle with nuts. Refrigerate 10 min. or until chocolate is firm. Cut each slice into 4 pieces with kitchen shears. Bacon can be baked ahead of time. Drain, then refrigerate up to 24 hours before brushing with melted chocolate and continuing as directed. For a touch of heat, stir 1/4 tsp. chipotle chile pepper powder or cayenne pepper into melted chocolate before spreading over bacon.